They wear pink saris, the traditional Indian dress for women, go after corrupt officials and boorish men, and brandish sticks and axes when the push comes to shove. The several hundred vigilante women of India's northern Uttar Pradesh state's Banda area proudly call themselves the "gulabi gang" (pink gang) striking fear in the hearts of wrongdoers and earning the grudging respect of officials. Two years after they gave themselves a name and an attire, the pink women have thrashed men who have abandoned or beaten their wives and unearthed corruption in the distribution of food grains for the poor. They have also stormed a police station and thrashed a policeman after they took in an untouchable man and refused to register a case. It is one of the poorest 200 districts in India which were first targeted for the federal government's massive jobs for work programme. 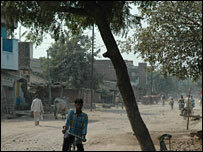 Over 20% of its 1.6 million people living in 600 villages are lower castes or untouchables. Drought has parched its already arid, single-crop lands. To make matters worse, women bear the brunt of poverty and discrimination in Banda's highly caste-ridden, feudalistic and male dominated society. Dowry demands, domestic and sexual violence are common. 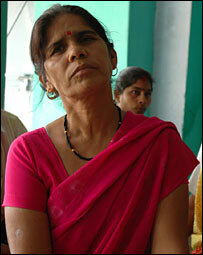 Sampat Pal Devi is a wiry woman, wife of an ice cream vendor, mother of five children, and a former government health worker who has birthed and led the "pink gang". Her seeds of rebellion were sown very early on when in face of her parents' resistance to send her to school, she began writing and drawing on the walls, floors, and dust caked village streets. She finally ended up going to school, but was married off when she was nine in a region where child marriages are common. At 12, she went to live with her husband, and at 13, she had her first child. 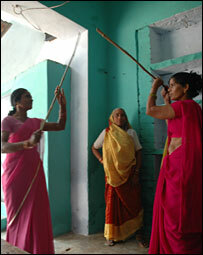 Sampat Devi tells her "gang" that they will soon march to the girls house and demand an explanation from the husband. "If they don't take her back and keep her well, we will resort to other measures," she says. That is also why men like Jai Prakash Shivhari join the "gulabi" gang and talk with remarkable alacrity about child marriages, dowry deaths, depleting water resources, farm subsidies, and how funds are being stolen in government works. "We don't want donations or handouts. We don't want appeasement or affirmative action. Give us work, pay us proper wages, and restore our dignity," he says. They already claimed to have done some work in combating crime and corruption in the area. Last year, Sampat Devi contested the state polls as an independent candidate and mustered only 2,800 votes. Permalink Submitted by root on Thu, 2007-12-20 19:27.